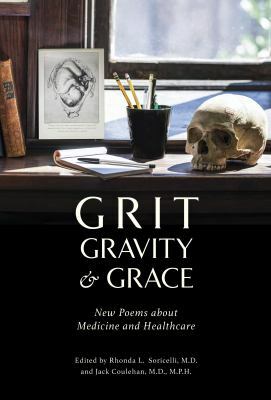 Grit, Gravity & Grace: New Poems About Medicine and Healthcare is a modest collection of forty-one poems by thirty-eight poets that originated from a poetry competition sponsored by the Section on Medicine and the Arts at The College of Physicians of Philadelphia in the winter of 2014 - 2015. The primary goal of the competition was to bring together poets and those who love poetry from all walks of life in a shared poetic dialogue about medicine, health and healthcare. The secondary goal was to host an evening poetry event at The College in celebration of the 25th anniversary of National Poetry Month in April 2015. 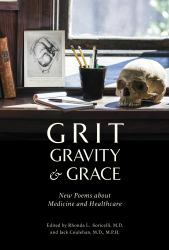 Poems in this collection are by students, health care practitioners, educators, patients, and their families. They capture unique experiences and perspectives; they speak of vulnerability and ambivalence, insight and epiphany. Some bear witness to caregivers' compassion, others to detachment. Some observe illness and the human condition with humor, others with profound sadness.The poems are grouped by season as many capture images relevant to a particular time of the year or focus on a disease that peaks during certain months. "Spring" allows us to move from the joy of new birth to the angst of adolescence, from the nourishing nature of intravenous therapy to the fresh bloom of life following remission from cancer. "Summer" reminds us of the devastating polio epidemics of years gone by but also invokes optimism, vacations, the promise of new discoveries and experiences. "Autumn" presents a time for reflection on what it means to be a student, to suffer from depression, to struggle as the caregiver of an aging parent, or acknowledge the growing frailty of the body. "Winter" devolves into dire diagnoses, threats to one's sense of self, and the fears and realities of death, dying and loss; yet even here, the warmth, beauty and resilience of human nature prevail.